It can be hard to believe something that's been regarded as the best for a very long time can continue to get better and stay ahead of the competition, but that's exactly how it is with the 2019 Ford F-150. Rival manufacturers keep trying to come up with a full-size pickup truck to seriously rival the imperious Ford F-150, but they all keep falling well short. To be fair, there isn’t a huge array of enhancements to the F-150 for the 2019 model year, but let's take a look at what they are as well as reminding ourselves of why the F-150 is far and away the truck by which all others are measured. For a while now, if buyers wanted the most powerful engine the F-150 offers it meant going for the off-road focused performance version, the F-150 Raptor. While that may have been ok for a lot of buyers, those who weren't bothered about off-road capability and were more interested in comfort and luxury had to settle for something less powerful. Ford has decided this situation needed remedying, which is why the high-output 3.5-litre EcoBoost V-6 is now also available in the super-luxurious Limited trim level of the F-150. On top of the engine upgrade, the Limited is now also available with a new high-flow dual-exhaust system and a redesigned interior. Three new colours are introduced to the F-150 palette for the new model year, which are Agate Black, Abyss Gray and Silver Spruce. The Navy Pier interior colour scheme has been changed to Camel Black two-tone, The F-150 XLT now gets FordPass Connect standard, and the XLT Sport Package now features some new five-inch angular step bars. There's a problem when it comes to naming the highlights of what makes the current F-150 not only the best of Ford trucks, but the best full-size light-duty truck in the market. That problem is there are just some many reasons the Ford is way ahead of the competition. For a start, there are so many ways the F-150 can be specified it seems possible millions of them could be produced without any two needing to be the same. 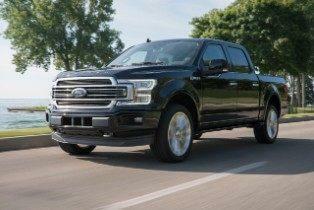 There are F-150s to suit a huge range of tastes, requirements, applications and budgets. It's hard to think of a rival with anything close to as impressive a lineup of engines as the F-150, and the one gaping omission has now been addressed with the introduction of the F-150's first ever turbodiesel engine. The base 3.3-litre V-6 is certainly no slouch with its 290 horsepower and 265 lb.-ft. of torque, but the majority of retail customers tend to opt for the sensational 2.7-litre turbocharged V-6 with its 325 horsepower and 400 lb.-ft. There's as much comfort, luxury and technology as you’re prepared to pay for in the 2019 lineup, but the key feature of this seemingly omnipotent pickup is its imperious capability. When it comes to towing, none of the Ford's rivals can match its best-in-class conventional tow rating of up to 13,200 pounds (5,987kg). It's a similar story with payload as the maximum an F-150 can handle when properly configured is a mighty 2,309 pounds (1,047kg). For more information about the 2019 Ford F-150 and to arrange a test drive to find out which one is right for you, don’t hesitate to get in touch with us today here at Van Isle Ford Sales, the number one choice Ford dealer in Port Alberni, BC and surrounding area.